For maximum dryness and comfort, use Comfort-Aire Briefs. Treated with curly fibers to offer ideal skin dryness and help control odor and buffer urine pH. Breathable side panels offer increased airflow and comfort, and the cloth-like outer cover is comfortable against skin, minimizing the risk of irritation and rashes. Skin-safe "grab anywhere" closure system reduces waste. 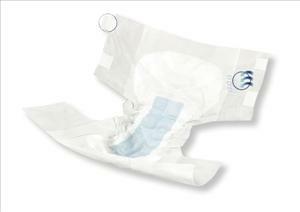 Triple absorbent core helps provide maximum dryness for improved comfort and healthy skin. Extra-wide tabs for secure fit. Wetness indicator changes color when garment has been soiled. Regular, 40" - 50" (102 cm - 127 cm). Purple, 72/cs, 24/bg.